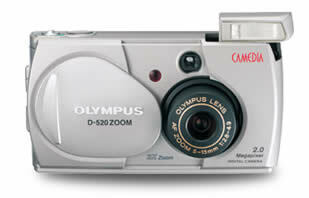 My latest camera is the Olympus Camedia C220. There had been some smaller problems to use it with Linux. Here I describe a possible solution. With newer kernels (2.6 or 2.4.21) there is no need for the patch below. But with older kernels you might have to apply the patch. A note sent by Thomas M. from Berlin: Bei meiner Olympus D-100 (manchmal auch "C-1" oder "c-you" gennant) funktionierte es auch wie beschrieben. For all non-Germans: This patch should also work for the Olympus D-100 also known as C-1 or c-you. As I hear now, the C220 seems to be sold in other coutries also as D520. The camera has an USB-connection and should act like an USB storage device. So plug in the USB cable into the computer and the camera and ... BOOM . After 5 seconds the computer hangs. You have to press the reset button. Clever guys analyzed the problem and found out, that the camera is not sending the USBS identification string, but an USBU string. This USBU confuses the USB-storage kernel module, that the whole computer hangs. If the camera is your only USB-storage device, then there is an easy way to get the camera running: let the kernel module react to the USBU ID instead of the USBS. Then you can access the camera, but no other USB storage device. How to do it: a clean solution is to change the definition in the kernel module source, and recompile it. But then you need the sources, and headers. You must know, what file to patch. And you must know how to compile and install the kernel sources. If you are not experienced, then you may spend a weekend on it. There are betters things to do on a weekend. So here a more pragmatic (and brutal) solution: patch the exisiting kernel module. Ok, you also have to compile for it, but it is only an 30-liner. Do all the following on your own risk. It works on my machine, but it might not work on your machine. Make a backup of your data before! and you get the program usbp. That is all you need. And the old module is loaded. a side effect is, that it shows the location of the modules. On my machine it says /lib/modules/2.4.18-64GB-SMP/kernel/drivers/usb/storage/usb-storage.o . So the location is /lib/modules/2.4.18-64GB-SMP/kernel/drivers/usb/storage/ . Copy the usbp program into that directory and cd into it. You saved the original module, and activated the new module. If you have Windows installed, then you have to reboot the machine. Jul 14 12:31:03 hawaii kernel: usb.c: USB device 2 (vend/prod 0x7b4/0x102) is not claimed by any active driver. Now you only have to mount the directory and the you can access the pictures. I created a directory called /olympus . and you are in the directory with all the images. Now you can look at them, copy them, do whatever you want to do with them. At the end leave the directory and unmount it. What I described is the way I did, and how it worked on my machine. Because you have to do all as root, there is the possibility, that you might damage your system. On other systems these steps might also not work. If it does not work, I can not help you, because I don't know your system, or what might be different to my system. So everything you do is on your own risk! Another thing I found out is: the USB-storage and the DSL with pppoe do not work together on my system. I can either go into the internet, or access the camera. But not both at the same time.